It seems to be holding true here. There is definitely a north wind blowing, and promising snow. And, while I've heard rumors of robins in town already, we have yet to see any in our yard. Apparently, they are hiding out until the good weather arrives to stay. 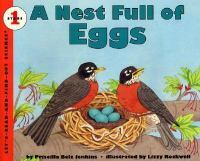 In the meantime, we're reading Priscilla Beiz Jenkins' Nest Full of Eggs, another of the level 1, Let's-Read-and-Find-Out Science series. And, turning our empty cereal boxes into rocking robin cards, an idea I found on Marghanita's Nature blog, where strangely, to me, it's listed as a Christmas craft. I can see we've got a geography project ahead of us - Where do robins go in the winter? The girls (my youngest two ages 5 and 3), traced a couple of circles on the back of an unfolded cereal box. I cut them out, and folded them in half. And, since our box was orange, I also used it to cut out some diamonds for beaks, and strips for tail feathers, otherwise I could have used construction paper. Once everything was dry, the girls added googly eyes, and wads of red tissue paper to the robin breasts. ...even if the sky outside, does not. For more story stretching arts and crafts projects for children, check out this week's stART (story+ art) link up, hosted by A Mommy's Adventures. Or, to find more flat projects click over to this month's Unplugged Project page, at Unplug Your Kids. Those birds look so sweet, great craft! The robins are beautiful. I need to get out our LRAFO books - we have that one, but didn't read it yet. I hope you'll have a better weather soon! The snow managed to miss us and the robins were out in the street this morning. I love the craft...a wonderful way to recycle a cereal box! I've seen these half-circle birds around, but yours are especially sweet! Where do you live? It's mid-80s and HOT here in VA.
Christianne - We're in Montana, in the middle of the Rockies, so a cold blustry spring, is not really rare. What brilliant looking robins! Now you just need to be able to hear them sing! I keep hoping you'll get nicer weather soon, it has to come soon doesn't it? You know this could be adapted to all sorts of things. Now my head is spinning with ideas. Those birds turned out awesome! They did a wonderful job! Aww, those are so cute! Thanks so much for the how-to, I'll be linking. The birds looks so wonderful! Good job! I love recycled projects! Wow these look amazing. I love recycled art projects too. I have to say I was so excited when I saw a robin in the yard the other day! I will have to check the library for this book. Thank you for linking up and sharing your book and art project! So cute! You are a FunMum! Hello- I found this craft on Make and Takes and would love to link and use the photo on Ohdeedoh.com tomorrow. Would that be alright? Thank you. LOVE this!! I will be linking for Earth Day this year! Thank you! Wordless Wednesday - Too Much Flower Power? Sugar Cookie Easter Church - Disaster?